Why you shouldn’t be so scared of bats. Bats should be scared of humans. 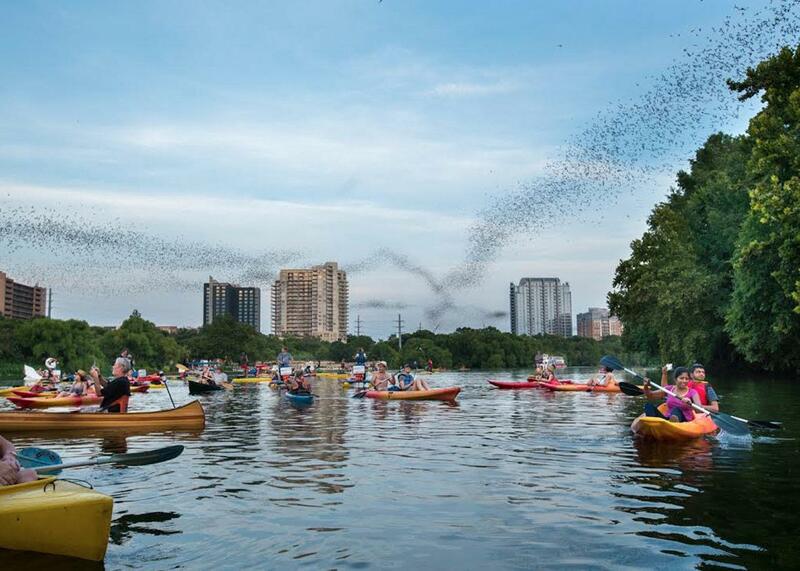 Millions of tourists have safely observed 1.5 million free-tailed bats close-up for more than 35 years as they emerge from beneath the Congress Avenue Bridge in Austin, Texas. Bats, too often, get a bum rap. They’re the bloodsucking supernatural villains of Bram Stoker fame. They’re the familiar figure of speech to imply insanity (acting batty, bats in your belfry, batshit crazy). They’re dirty, winged rodents of the night sky. Never mind that most species eat insects, sport some serious social intelligence and communication skills, groom their fur with the diligence of a housecat, and are probably no more closely related to rats than we are. But perhaps the most pervasive misconception about bats is the one linking them to deadly diseases. Disease transmission from bats to humans is exceedingly rare. In fact, the possibility was not even recognized in the U.S. till 1953, when the first rabid bat was found. The discovery quickly made sensational news headlines and big profits for rabies and pest control industries. In perspective, fewer humans have died of batborne diseases, worldwide, in the past 20 years than die annually in the U.S. alone from antibiotic-resistant infections. Yet sensational scare stories continue to dominate news about bats. For example, a February report on NPR, “Why Killer Viruses Are On The Rise,” portrays bats as “arguably one of the most dangerous animals in the world” and warns that “when there are bats up in the sky, there could be Ebola in that poop that lands on your shoulder.” Sounds terrifying. When we take a closer look at what scientists actually know about bats, stories like these tend to fall apart. Research strongly suggests that such public health and media furor is at best overstated—and likely distracts from more important research. In truth, we probably don’t need to worry very much about bats harming us. Rather, we should really be worrying about the harm we inflict on bats in the name of protecting humans. It makes sense that bats have been connected with viruses. Both are little known, easily feared, and ideal for convincing governments to invest huge grants to protect us—much easier and less controversial than, for example, protecting us from toxic pesticides. New viruses can be found wherever we look. By focusing on those found in bats, we’re creating a self-perpetuating cycle of emphasis that is likely unwarranted. Bats and humans have shared caves, thatched huts, and log cabins for thousands of years with an outstanding safety record. Even now, millions of bats co-inhabit major cities. In my hometown of Austin, Texas, millions of tourists have viewed our 1.5 million free-tailed bats close-up without harm for decades. Small signs simply warn not to handle the bats and to seek medical attention if bitten. Like any wild animal, bats may bite in self-defense if handled. But a bat flying overhead isn’t likely to give you Ebola or any other disease. NPR’s Ebola story is fairly typical of the recent scientific and media attention linking bats and rare but scary diseases. Long before research began to point in other directions, the idea that bats could transmit Ebola to humans had spread widely. As early as 2005, Nature published a piece suggesting fruit bats could act as reservoirs for the deadly virus. In 2011, in another Nature piece, epidemiologists warned West Africans were at risk from bat epidemics. Then came the 2014–16 Ebola outbreak in West Africa, which would eventually kill 11,325 people. Science joined in, asking, “are bats spreading Ebola across Sub-Saharan Africa?” Soon after, scientists at a National Institutes of Health press conference blamed straw-colored fruit bats for the outbreak, generating headline news. But it was a giant leap of faith since no evidence of bat infection was found, nor had the index case, a 2-year-old boy in Guinea who died Dec. 28, 2013, been near such a bat. By late 2014, a 30-author academic article published in EMBO Molecular Medicine speculated that the outbreak stemmed from a single animal-to-human transmission (the same index case in Guinea) who “may have been infected by playing in a hollow tree housing a colony of insectivorous free-tailed bats.” BBC News, the Washington Post, the Atlantic, and other media outlets around the world again dutifully reported a deadly bat story. But the evidence the paper leveled against free-tailed bats was, again, extremely slim. Epidemiologists failed to find the Ebola virus in these or any of a dozen other bat species examined in the area. In fact, villagers reported routinely capturing and eating bats from the hollow tree where the toddler was purportedly exposed, and none became sick. Instead, the authors pointed to data that showed free-tailed bats could survive experimental infection and that other wild bat species had tested positive for Ebola antibodies, hinting at prior exposures. Since the research team wasn’t able to identify any other potentially infected animals or humans the boy may have been exposed to, the free-tailed bats became prime suspects. Though the EMBO paper warned against killing bats because of “crucial ecosystem services with direct and invaluable benefits to humans,” villagers burned the hollow tree where the bats lived—with the bats inside. Despite a decade of headlined speculation and an intensive search for an Ebola reservoir, focused primarily on tracing it to bats, the evidence against bats as reservoirs remains scant. The geographical distribution of genetically distinct Ebola virus species along separate river basins isn’t consistent with such a highly mobile source. Researchers have also repeatedly failed to isolate infectious Ebola viruses from a wide variety of fruit- and insect-eating bats caught at outbreak locations. Though some serologic surveys, such as ones testing for Ebola-linked antibodies, indicate possible exposure, complete viral genomes—the gold standard of verification—have never been obtained. Bats artificially infected in lab experiments don’t mean much, either, since they haven’t shown evidence of viral shedding (contagiousness). Nor has anyone successfully infected another animal with Ebola via a bat. To be sure, the probe hasn’t definitively ruled bats out, but a growing body of evidence does point elsewhere. This wouldn’t be the first time bats were prematurely blamed. When Middle East respiratory syndrome was first identified in 2012, news sections for both Science and Nature rushed to blame the disease on bats. However, subsequent findings strongly implicate camels as the only reservoir of importance. In the case of Ebola, some scientists are now calling for a broader research focus. Jens Kuhn, a virologist at the National Institute of Allergy and Infectious Diseases, told Nature in 2016, “I don’t buy the bat story for Ebola virus, not at all.” He explained that he thinks that bats are far too abundant, and too closely associated with humans, to explain an infection that emerged just two dozen times in more than 40 years. He speculated that an unsuspected host—possibly bugs or fungi—could be the real culprit. The same report also noted that the U.S. Agency for International Development, too, is expanding its search, with plans for a two-year survey looking into the Ebola virus–transmitting potential of other animals, including rodents, livestock, dogs, and cats. The Ebola example also gets at a larger point—that the obsession with bats can pull limited resources from investigating and raising awareness about other plausible transmitters of diseases. It’s a bias encouraged by our long history of seeing bats as objects of mystery and fear, but there’s also at least one highly practical factor: There’s no group of mammals easier to sample as quickly or as widely as bats. Obtaining significant samples of, say, wild monkeys, feral dogs and cats, or even rodents is time-consuming. But bats can be captured, hundreds at a time, as they emerge from colonial roosts. I know from experience: I’ve collected a wide variety of mammals for the Smithsonian, and I invented a trap now widely used by virologists to sample bats. In the hypercompetitive world of academic science, it’s easier and cheaper to do research on viruses in bats than in most other species. So that’s the research that often gets done. In addition to skewing public health priorities, characterization of bats as ranking among our planet’s most dangerous animals now threatens to reverse decades of conservation progress. People who believe bats can infect them with diseases like Ebola by merely flying over and “pooping” on them are unlikely to tolerate bats. In my experience, when people learn the truth—that simply left alone, bats pose one of our planet’s least likely risks and rank among our most valuable neighbors—they quickly become enthusiastic protectors. Bat services are critical. As even those who exaggerate risks acknowledge, bats should not be killed. They keep the vast numbers of night-flying insects in check, pollinate flowers, and carry seeds for critically important plants. Bats also safeguard our health by reducing demands for toxic pesticides—one of our planet’s most serious, but too often ignored, health threats. Furthermore, bats are highly resistant to cancer, arthritis, and many scary diseases lethal to humans. Why not investigate how knowledge of bats can be used to improve our own survival? Due to sensational, often premature speculation, decades of conservation progress for bats is now in jeopardy. Bats play an extremely important role in ecosystems worldwide, and contribute greatly to human well-being. But because they form large, conspicuous aggregations, yet typically rear just one young per year, bats are especially vulnerable to mass killing and extinction. At a time when our future is threatened by loss of biodiversity, and budgets for health care are stretched to the limit, it is difficult to justify disproportionate investment in a hunt for rare viruses in bats.